Is this mean? It feels a little mean. But it’s also a little funny. 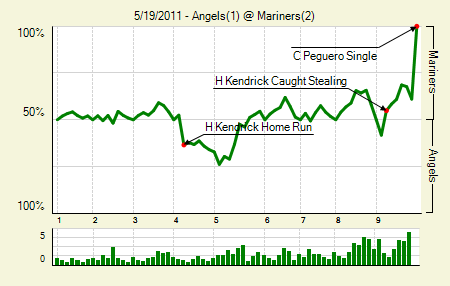 Moving the Needle: Carlos Peguero singles home the winning run, +.389 WPA. OK, so calling it a single was a bit generous. It was nothing but a routine fly ball, just a few steps away from Torii Hunter. But he lost it in the sun and fell to the ground. Doug Fister: 8 IP, 6 H, 1 R, 2 BB, 2 K, 1 HR, 10 GB. 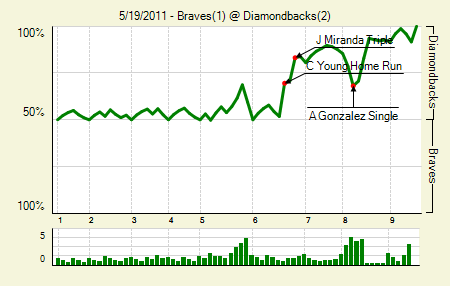 You might look at this line and think that even with the ground balls Fister is lucking his way into results. But despite his low K rate, he has a FIP and xFIP that aren’t too far off the mark. Dan Haren: 8 IP, 3 H, 1 R, 4 BB, 5 K. He’s gone at least into the seventh in each of his last five starts, and he’s allowed 10 runs over that span. The Angels have won just two. 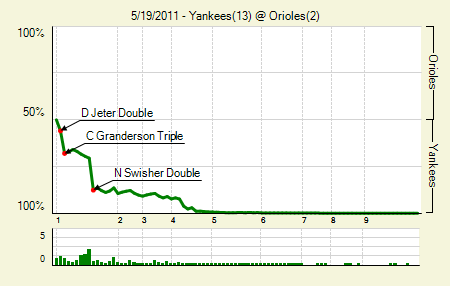 Moving the Needle: Nick Swisher clears the bases with a double, +.171 WPA. It’s not often you see a WPA-leading play that makes the score 5-0. The exception, of course, comes when it’s 2-0 and the play is a three-run double. The Yankees got a pair in the first with a double, a triple, and a sac fly. Then, with none on and two outs, Brad Bergesen plunked Robinson Cano, which, apparently, the Yankees thought was intentional on account of Cano ending their 15-inning affair the previous night with a double. If it was intentional, it backfired horribly. Bergesen walked the next two guys, bringing Swisher up with the bases loaded. He belted one the other way, just out of Felix Pie’s reach in left. The hit set the tone for the game, as the Yanks came up with eight more runs and an easy win. CC Sabathia: 8 IP, 7 H, 0 R, 0 BB, 9 K. After a long extra-innings game, a team could use two things: an offensive breakout, or a shutdown performance from the starter. The Yanks got both. Jorge Posada: 1 for 3, 1 2B, 2 BB. He made a bid for his first hit right-handed this season, but it died at the warning track. He’s still been remarkably better in May (.279/.404/.372) than he was in April (.125/.232/.375). Moving the Needle: Walker continues the assault on Cueto with a two-run double, +.249 WPA. Johnny Cueto had allowed no runs through the first four innings, though he did escape a bases loaded jam in the second. But when the Pirates threatened in the fifth, they followed through. Andrew McCutchen started it with a two-out double and came around to score on a single. After a walk Walker came to the plate, and he lined one over the center fielder’s head and off the wall, bringing home both runners and putting the Pirates up 3-1. Jay Bruce: 3 for 4, 2 HR. Obviously, the only runs the Reds scored all day. That’s 10 homers in 174 PA for him this season. James McDonald: 6.2 IP, 7 H, 1 R, 1 ER, 1 BB, 4 K, 1 HR. Early in the season I find it tough to buy most excuses for poor performances. Slumps happen, correlation not necessarily causation, etc. But I’m buying that McDonald’s spring injuries led to his slow start. In his last five starts: 28.2 IP, 25 H, 8 R, 11 BB, 27 K, and that includes his stinker the previous time out. Moving the Needle: Miguel Cabrera ties it up in the eighth with a homer, +.232 WPA. 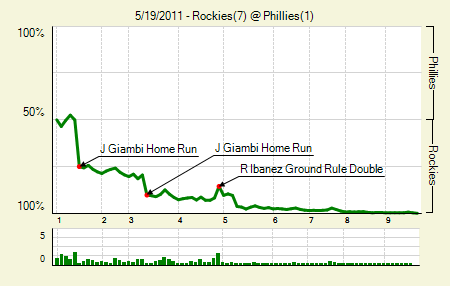 It’s probably just confirmation bias, but it seems as though a lot of walk-offs this year are relatively determined. That is, the situation already has the WPA needle over 80%. Last night, for instance, Carl Crawford’s walk-off single was only +.162 WPA, because the bases were loaded with one out in a tie game. 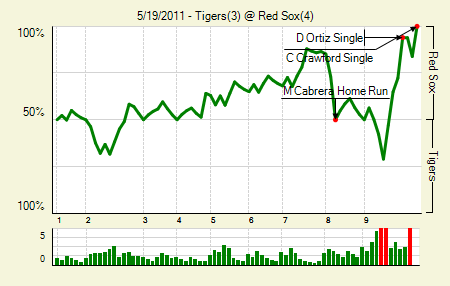 The big swing came in the eighth, when the Tigers battled back from down 3-1 to tie the game. Brennan Boesch got the first homer, and then Cabrera sent one over the monster for the tie. Shame they couldn’t get that one more run. David Ortiz: 3 for 4, 1 HR. He’s down a little power (but then again, so is everyone), but otherwise he’s right around his numbers from last year. Justin Verlander: 8 IP, 6 H, 3 R, 0 BB, 9 K. Josh Beckett was actually going just as well — 6 IP, 5 H, 1 R, 2 BB, 3 K — but he was pulled after just those six. It wasn’t quite the pitcher’s duel that it could have been, but the game was no worse for it. Moving the Needle: Jason Giambi gets three with one swing, +.249 WPA. This game was all Jason Giambi; he just let the other 17 guys share time on the field. He smacked three homers, accounting for 100% of the Rockies’ runs for the evening. The biggest, per WPA, and per distance, came in the first, a shot out into the second deck in right field. His second one, a two-run shot, landed just below that, and the third, another two-run homer, cleared with fence with plenty left. Not the best game for Kyle Kendrick, who surrendered the first two homers. Jhoulys Chacin: 7 IP, 4 H, 1 R, 1 BB, 9 K, 9 GB. No homers and only one walk in this one will help the old FIP. It’s still well ahead of his ERA, but it’s a bit closer now. Moving the Needle: Justin Morneau starts to break it open with a two-run homer, +.133 WPA. 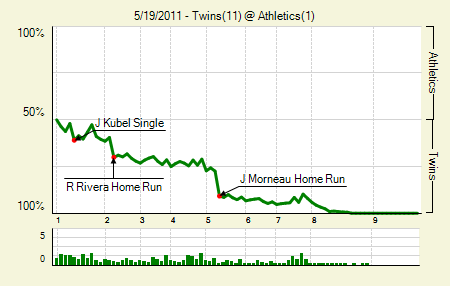 As the final score indicates, the Twins really piled it on here. That’s something they’ve needed to do for months. I’d say it’s odd that they did it in a pitcher’s park such as the Colisseum, but their scoring 11 runs is so odd in the first place that it almost makes sense. They picked up a pair early, one on an unexpected home run from Rene Rivera. In the fifth, Morneau put them further in front, hitting a vintage shot to right-center. It wasn’t until the eighth that the Twins really broke out, putting a six-spot on the board. Morneau added a single and a double in the game. He is finally over the .300 OBP barrier. Nick Blackburn: 7 IP, 5 H, 1 R, 2 BB, 1 K, 14 GB. That’s more like it from Blackburn, who struck out 13 in his previous two starts. Also, I write a BlackBerry site, and every time I go to write Blackburn it comes out BlackBurn. That gets to be obnoxious after a while. Rene Rivera: 2 for 4, 1 HR, 1 BB. I’m sure it’s been said before that this is his first big league home run since July 9th, 2006. Next up: a double, which he hasn’t hit since July 26th, 2006. He has, unsurprisingly, no career triples. 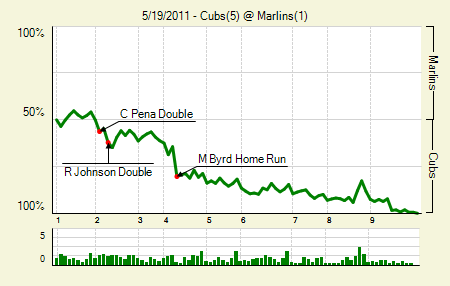 Moving the Needle: Marlon Byrd extends the Cubs’ lead with a homer, +.159 WPA. Casey Coleman did take care of business for the Cubs, but with five walks in 5.2 innings, things were definitely shaky at times. In those situations, nothing eases tension like runs. Byrd helped in that regard, crushing a home run over the big wall in left field to make it a 3-0 game. The Marlins would make something of it, but with a little insurance the Cubs walked away winners of the pair in Miami. Starlin Castro: 2 for 4, 1 2B. He had been in the first three lineup spots for the start of the season. But he hit a slump, got dropped to six or seven for a couple of games, and is back to hitting leadoff or third. Since the short demotion: .447/.475/.605. Moving the Needle: Paul Konerko doubles home a pair to give his team the lead, +.168 WPA. 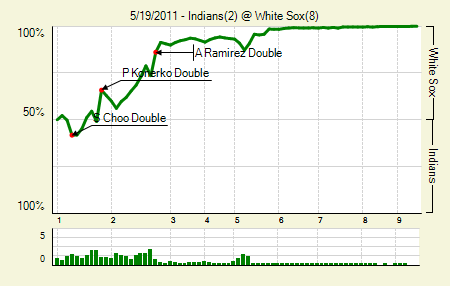 The Indians struck first, but the White Sox didn’t let that lead last long. Juan Pierre doubled to lead off the bottom of the first, and then Alexei Ramirez got hit by a pitch. Two batters later Konerko doubled off the base of the wall in left and brought home both runners. It wasn’t until the next inning that they’d really break though; by the end of two innings it was 6-1 White Sox. Carlos Quentin: 2 for 3, 1 HR, 1 BB. That’s his ninth of the year, but it seems as though he’s hit more. I guess that’s because it’s his first homer since May 9th. Gavin Floyd: 7 IP, 5 H, 1 R, 1 BB, 3 K. Some nights they go down easier than others. Floyd didn’t have to overpower the Indians, but he got the job done, and with efficiency. He was at just 87 pitches when he exited the game. Moving the Needle: Justin Turner comes through with a man in scoring position, +.143 WPA. 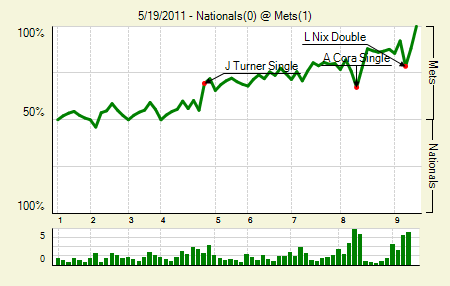 In a two-game series with the Nats, Justin Turner came through with the high WPA play both times. This time he did it with a well-timed single that put the Mets on top 1-0. He also made a nice play reaching into the stands and catching a foul ball, ending the seventh. Dillon Gee: 7.2 IP, 2 H, 0 R, 3 BB, 3 K, 11 GB. He’s done a good job filling in so far, and this has been his finest effort of the season to date. He did have a no-hitter going through 5.2, a fact that made its rounds on Twitter. To which I say: cool for the hometown fans, but who really cares if the guy hasn’t even gotten through the order twice? Keep it local until he’s through six at least, and really, unless I’m already watching the game, I’m not interested until after he’s through seven. Jason Bay: 3 for 4, 1 2B. They wanted to move him to the two-hole to get his bat started. Instead, he did it himself from the cleanup spot. Livan Hernandez: 7 IP, 7 H, 1 R, 2 BB, 7 K. His offense gave him exactly zero support, but it’s tough to ignore another solid outing by Livan. Moving the Needle: Mike Aviles ties the game in the ninth with an infield single, +.393 WPA. Did Elvis Andrus blow this one? Here’s the situation: The Royals, down one in the ninth and facing Neftali Feliz, had runners on second and third with two outs. Aviles bounced one up the middle, but Andrus nabbed it before it could get to center. He spun, but never threw to first. Aviles isn’t the fastest runner, and I thought he had a shot at him. But instead he just looked over to third. The tying run came across to score without incident, sending the game to extras. I just don’t see why, with two outs, you wouldn’t try to throw to first. Maybe he just didn’t have a grip on the ball. But in any case, he did save the game; if the ball had dribbled into center the runner from second would surely have scored. 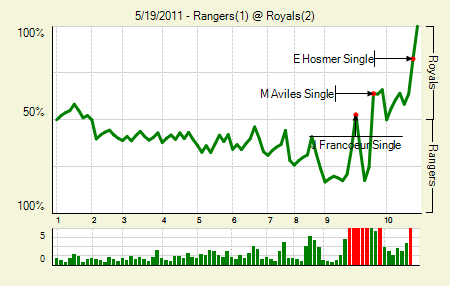 The Royals ended it the next inning, when Jeff Francoeur, with a runner on third, lined one into center. Luke Hochevar: 8.2 IP, 6 H, 1 R, 2 BB, 4 K, 1 HR, 13 GB. He got yanked when he allowed two hits with two outs in the ninth. He had retired the previous 10 in a row. Derek Holland: 8 IP, 9 H, 1 R, 1 BB, 5 K, 9 GB. He, too, pitched into the ninth, though he only faced one batter. Eric Hosmer singled, and would prove the tying run. Moving the Needle: Gerald Laird gets things started with a two-RBI double, +.156 WPA. After going down 1-2-3 in the first, the Cardinals got right to work in the second. They started with a single and a walk, and then Laird laid into a J.A. Happ pitch. It went sailing to left, and Carlos Lee knew that he’d either have to play it off the wall, or it was gone. That gave Colby Rasmus a nice head start, and he scored from first base. The hit gave the Cardinals an early lead; they’d hold it all game. Allen Craig: 3 for 4, 1 HR. He had been 2 for his previous 16 with no extra base hits before this one. 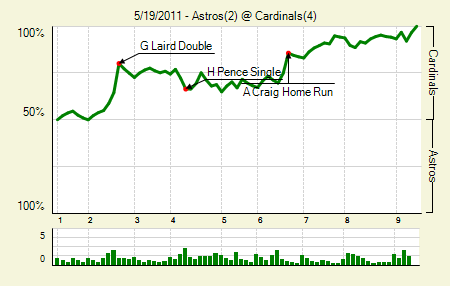 With Lance Berkman likely out for the weekend, they could use a little streak from Craig. Kyle McClellan: 8 IP, 5 H, 2 R, 0 BB, 5 K, 13 GB. The only downside is that he uncorked three wild pitches, one of which allowed a run to score. That might have prevented him from pitching the ninth; he was at just 90 pitches through eight. Moving the Needle: Chris Young starts a sixth-inning rally with a homer, +.178 WPA. It’s not often you see a rally start with a homer, but that’s what happened in Arizona. The DBacks and the Braves battled to a scoreless tie through five and a half, and then the Diamondbacks made two out to start their half of the sixth. But Chris Young got a pitch inside and turned on it, sending it into the stands for the game’s first run. The DBacks followed that with a single and a triple, adding a second run. Josh Collmenter: 6 IP, 2 H, 0 R, 0 BB, 1 K. He got by on moxie and gumption, apparently. It was not the prettiest of starts, but sometimes you catch the opposing offense on an off-day. Juan Miranda: 3 for 4, 1 3B. He’s worked well in his part-time roll, hitting .253/.371/.427 in 90 PA. That’s about the best the DBacks could ask for from the 28-year-old lefty. 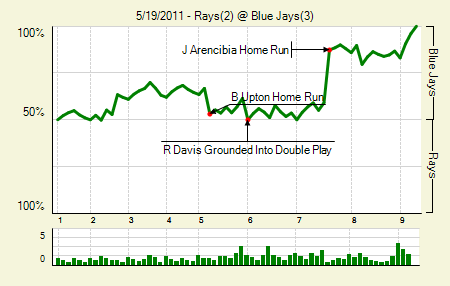 Moving the Needle: J.P. Arencibia breaks the tie with a two-run homer, +.282 WPA. 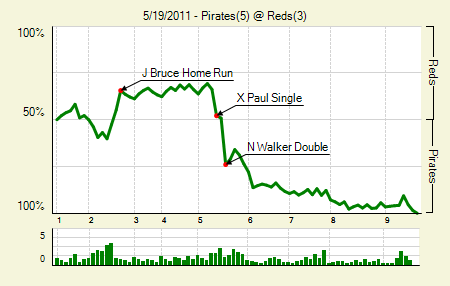 This is always fun: every run in this game came via the homer. Juan Rivera struck first, reaching out and lining one out to left, bouncing it off the top of the wall and into the stands. B.J. Upton answered a few innings later, putting a pristine swing on a ball and pulling it out of the park to left-center. The score remained 1-1 until the seventh, when Arencibia came up with Rivera on base. He absolutely crushed one out to left-center, the only multi-run homer of the game. Kelly Shoppach got the Rays back a run in the top of the eight, but after that there were no more homers. Ricky Romero: 7 IP, 3 H, 1 R, 2 BB, 6 K, 1 HR. He has 35 K in his last 32 IP. Wade Davis: 7.2 IP, 7 H, 3 R, 4 BB, 3 K, 2 HR. This is remarkable, because the guy has a 1:1 K/BB ratio and a 4.86 FIP, yet still has a 3.47 ERA. Moving the Needle: Nate Schierholtz saves Brian Wilson’s bacon, +.165 WPA. 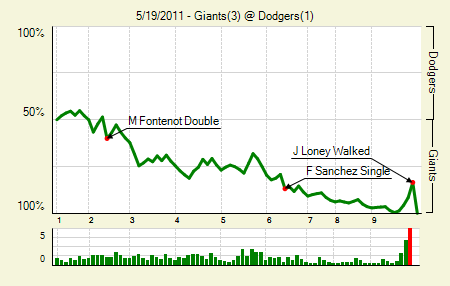 The Giants took a 3-0 lead into the ninth, and looked to be in good shape. The first two batters of the inning flied out, and so that made things look even better. But then a single and a double made it a two-run game. In came Wilson to close things out, and of course he walks the first two batters he faces to load them up. Jamey Carroll came to the plate, and he lined one to shallow right field. Schierholtz made what was, in results, a smart move by diving and catching it, saving the game. But really, if that ball had gotten by them there was nobody in the vicinity. The Dodgers could have won the game right there. 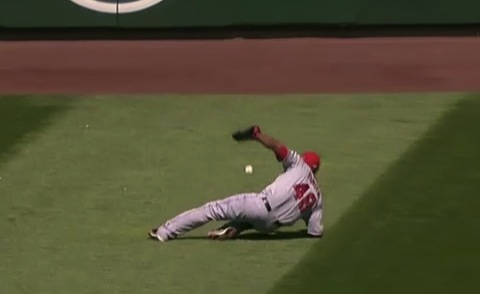 But it looked like Schierholtz had a bead on it. Tough end for the Dodgers. Madison Bumgarner: 8.2 IP, 6 H, 1 R, 2 BB, 3 K, 11 GB. I’m willing to bet he would have gotten the final out of the ninth quicker than Wilson did, though he was at 121 pitches and so it was easy to see why he came out. He also doubled and scored a run. Moving the Needle: Orlando Hudson ends the game with a sac fly, +.177 WPA. With apologies to Padres fans, who I’m sure enjoyed this win, a walk-off sac fly is as boring as it gets. This was a pitcher’s duel through and through, and really called for a more dramatic ending. 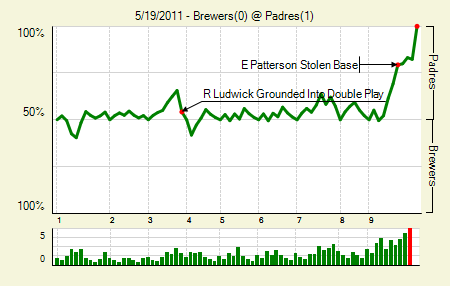 But the Padres loaded the bases with just one out in the ninth, which put their win expectancy at 82.3%. The sac fly, or something similar, was pretty much expected. Aaron Harang: 8 IP, 6 H, 0 R, BB, 4 K, 11 GB. He gave up more FB, but his ability to induce the grounder has come in handy. Chris Narveson: 7.1 IP, 5 H, 0 R, 1 BB, 4 K. He really only has one horrible start this year. Everything else has been solid to good. This might not be his best — he tossed seven innings and struck out nine in his second start of the year — but it kept the Brewers in it while the offense couldn’t scratch across a run. We hoped you liked reading The Morning After: Game Recaps for May 19th by Joe Pawlikowski!